Here is wishing everyone a happy Earth Day on this the 10th anniversary of the Ecobirder blog. The Florida Scrub-jay is a rather unique bird. This member of the Corvidae family is found only in central Florida. 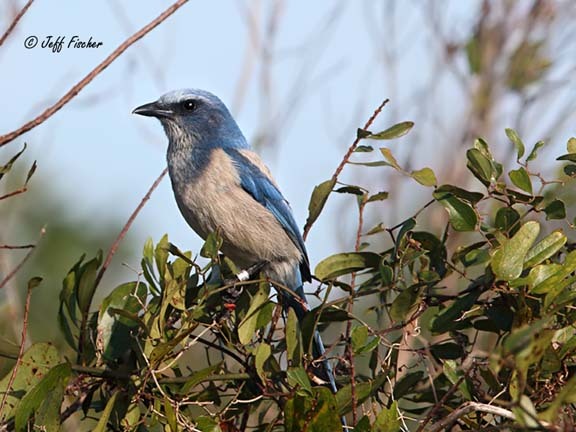 It is the only bird that is endemic to Florida and one of only 15 bird species that are endemic to the U.S. At one time they were considered the same species as the western scrub-jay but scientific study showed that they were genetically different enough to be identified as a separate species. They live, as family groups, in Florida scrub habitat. Unfortunately as this type of habitat has given way to development their numbers have dwindled. In 1975 it was listed as a threatened species in Florida and in the 1990's it was estimated that their were only 4000 pairs left in the wild. Because they are a member of the Corvidae family they are fairly intelligent. 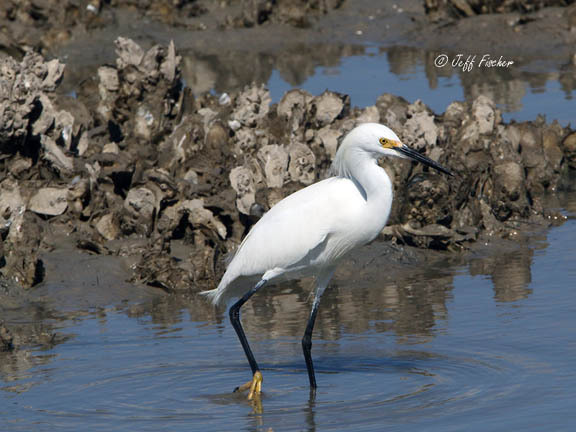 I photographed this bird at Merritt Island National Wildlife Refuge. Double-crested cormorants are found through out much of North America. They are usually found in fresh or salt water habitats where they hunt fish by diving under the water. They are great swimmers, partially because they do not produce preening oils like most other waterfowl. These oils help birds like geese and ducks keep their feathers waterproof. With out these oils the cormorants feathers can get wet, which makes them less buoyant. Having less buoyancy helps them swim better underwater than many other species of waterfowl. Unfortunately it means that they have to dry themselves off by holding their wings out in the sun in order to make themselves light enough to fly. In most places that I have traveled cormorants are quite skittish but things are quite different in south Florida. 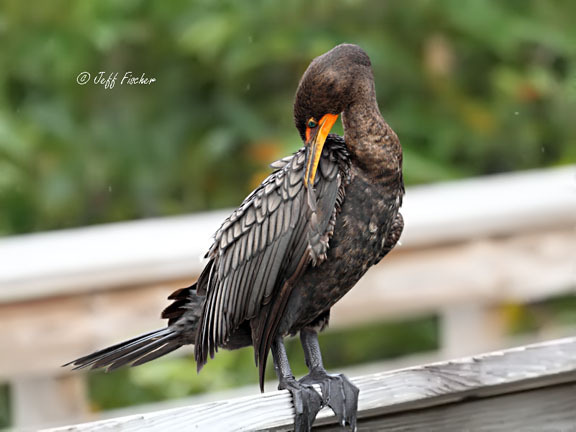 It was not uncommon to see cormorants perched on the boardwalk rails at locations like Green Cay Nature Center. Black Vultures are one of two vulture species found in North America. In the U.S. they range primarily in the southeast, although their range extends down through Mexico, Central America and through most of South America. Black Vultures do not have the olfactory sensitivity of Turkey Vultures so they often find food by following their cousins. 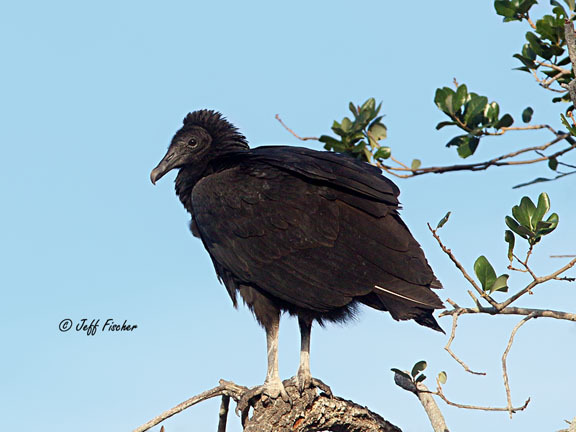 Since the Black Vulture is smaller they have a hard time taking food from the larger Turkey Vulture but since they are more communal, than their cousins, they often make up for their lack in size with force of numbers. 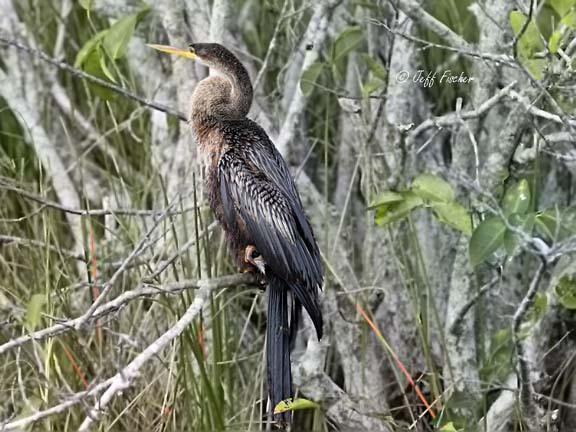 Anhingas are a waterfowl that is found primarily around fresh water swamps and marshes. In the U.S. they breed around the Gulf Coast from Florida to Texas, with he populations in Florida staying year round. They are more common in the coastal areas of Mexico and Central America as well as the northeastern half of South America. Their primary food source is fish, which they hunt by swimming under the water and stalking their prey though the aquatic vegetation and then stabbing them with their pointy beaks.Unfortunately anhingas do not produce the oils that ducks and other waterfowls use to waterproof their feathers, so after each swim the anhinga will look for a safe place where they can perch with their wings stretched out so that their feathers can dry. I took this photo at the Everglades National Park in south Florida. 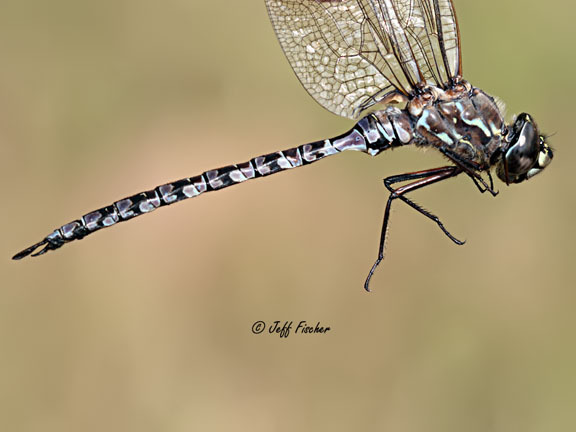 The zig zag darner is a dragonfly typically found primarily in eastern Canada. Their range does stretch down into a few northern states including some parts of Minnesota that are north of lake Superior, which is where I found this specimen. They are smaller than most other darners, prefer boggy type habitats, and emerge in late summer (August-September). They get their name from the wavy stripes on the side of their thorax. 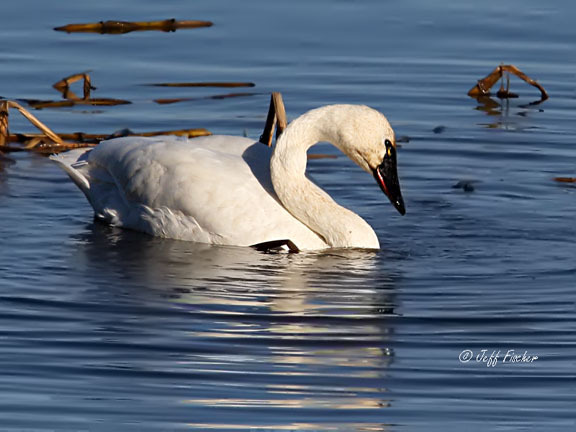 Last weekend I made my third trip down to southern Minnesota to photograph tundra swans. Each year tundra swans migrate from their breeding grounds up in Alaska and northern Canada down to the Atlantic or Pacific coasts of the southern United States. A large population, numbering in the thousands, stop over on the Mississippi River in Southern Minnesota to fill up on tubers, roots, of the arrowhead plant before heading east to the Carolina Coast. The migration here usually starts at the beginning of November but when I traveled down to the Upper Mississippi River Wildlife and Fish Refuge on the first week of November there were very few swans to photograph, and most were in the middle of the river. The second weekend in November, which is typically when the most swans are in the area, was a little better but still there were not many swans in the water by the overlook. The problem was that the weather was so mild with temps in the 60s to 70s that the swans put off migrating. Finally a dip in the temps brought enough swans down on the third weekend that some finally were with in photo range. Since each trip was about a two and a half hour drive each way I found other subjects to photograph on the trips where the swans were not around. There are usually a lot of bald eagles on the river this time of year. This one had almost completely molted into its mature adults feathers. With the little bit of black still on the head and tails I would estimate its age at six to seven yeas old. 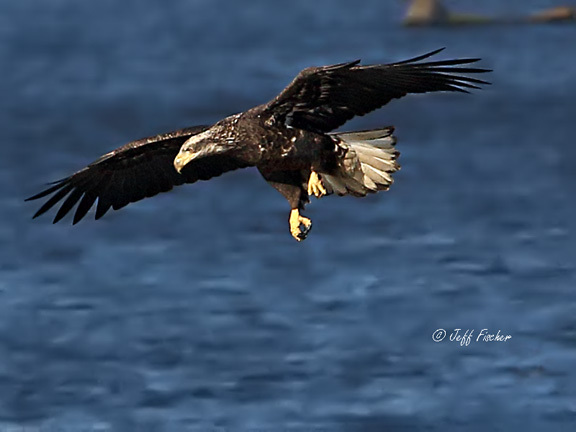 Besides fishing in the river the eagles will also go after the small ducks that are also migrating south. 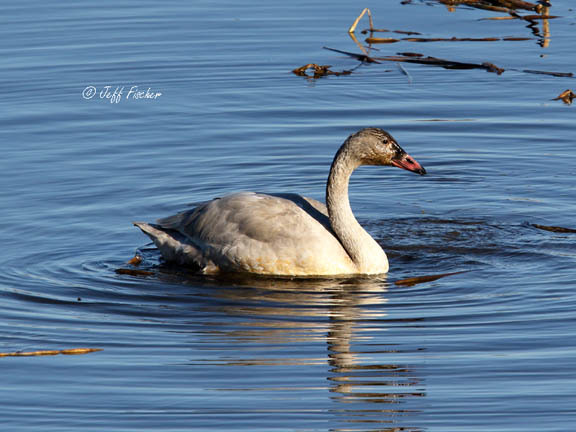 In a few weeks most of the river may be frozen, the swans and ducks will be on their way south to their wintering grounds, and the bald eagles that remain will congregate in spots where the river stays open. 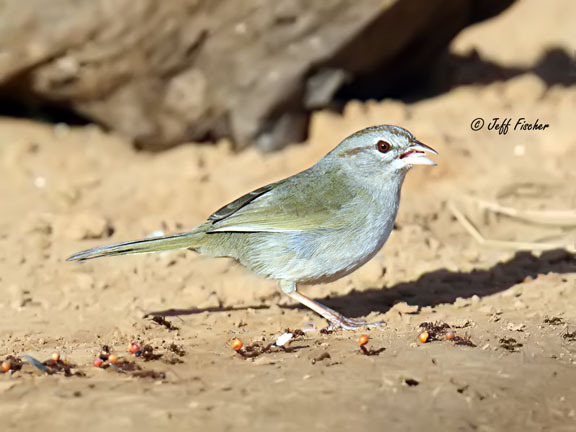 The olive sparrow is a secretive emberizine sparrow that is found in Mexico and Central America. In the United States it is found only in south Texas. Their preferred habitat includes dense thickets, semi-open scrub, chaparral and undergrowth near forests. They can often be heard foraging through the dense brush in search of insects, caterpillars and seeds. These pictures were taken in the Rio Grande Valley back in February. 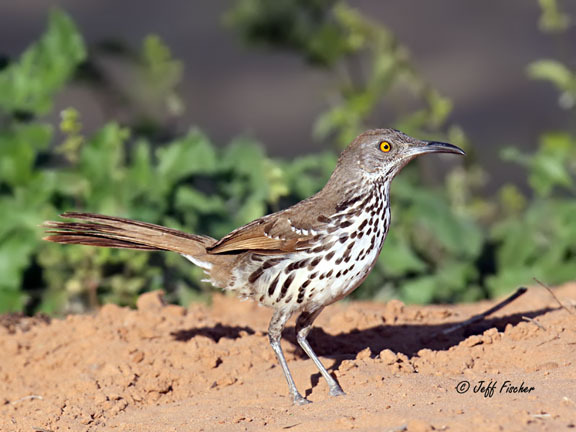 The long-billed thrasher is a southern relative of the more common brown thrasher. They are found in southern Texas and eastern Mexico. Their name is deceiving, since their beak is shorter then many other species of thrashers. They do however have a long tail. This photo was taken in the Rio Grande Valley of south Texas. 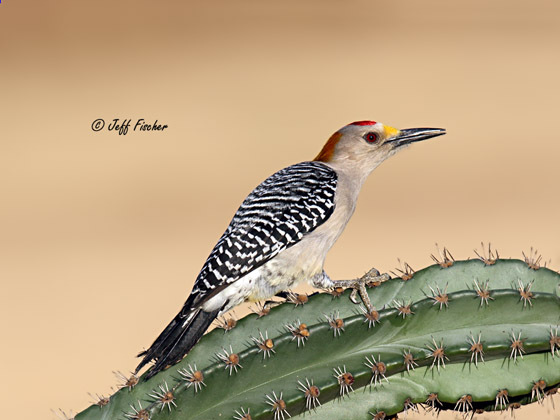 The golden-fronted woodpecker is one of the most colorful woodpeckers found in North America. Their range extends from southern Oklahoma, through Texas and eastern Mexico and down into Central America. There are four different subspecies that vary slightly in color that were once considered different species. They are closely related to the more common red-bellied woodpecker and where their ranges cross the golden-fronted will aggressively defend their territory against the red-bellies. Golden-fronted woodpeckers are found in open to semi-open woodlands. In the U.S. this includes mesquite brush land, orchards, groves, along rivers, and second growth forests. They are omnivores with a diet consisting partially of insects (grasshoppers, ants,beetles and other insects) and the rest of fruits, seeds and nuts. 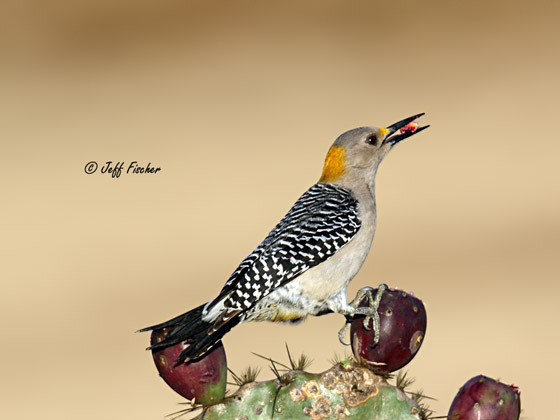 This female was eating some of the fruit from a prickly pair cactus. These shots were taken earlier this year down in Texas' Rio Grande Valley. The eastern screech owl is a small owl found in the eastern United States and north eastern Mexico. Although they are fairly common many people have never seen one. Looking at the picture above you may be able to guess the reason why? 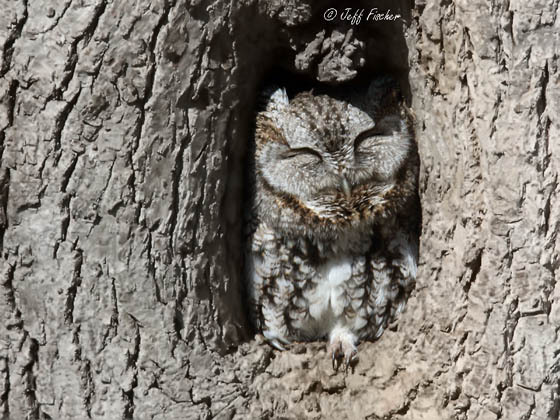 Eastern screech owls have pretty good camouflage. 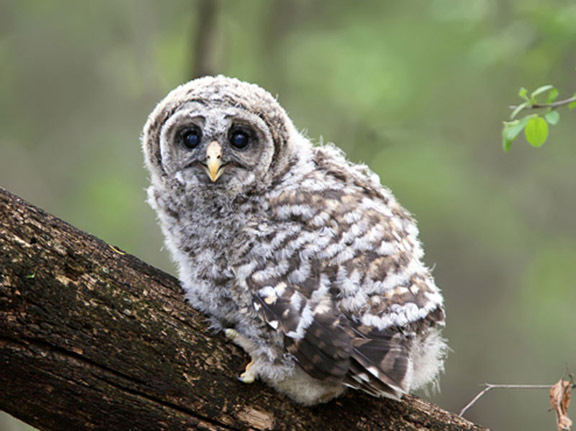 They are also primarily nocturnal or crepuscular, so they are most active at night or dusk and dawn. 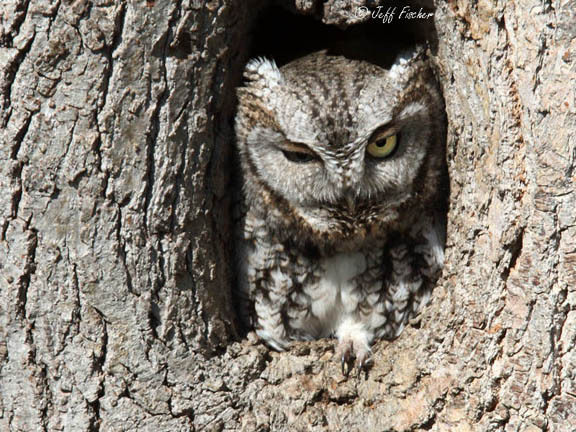 As a cavity nester they usually spend their day in a tree cavity or perched in dense tree foliage. This owl was quite popular back in March when I photographed it. On cold sunny days he would sit in the entrance to this cavity and sun himself. Many photographers new his location so he often had quite an audience. Unfortunately some photographers care more about a picture than they do the bird and while I was there one such photographer was playing calls to try and get the bird to open its eyes. The owl turned out to be smarter than the photographer and was not fooled. After the photographer left, I guess he did not like being confronted, the owl rewarded the rest of us by opening one eye to check us out. 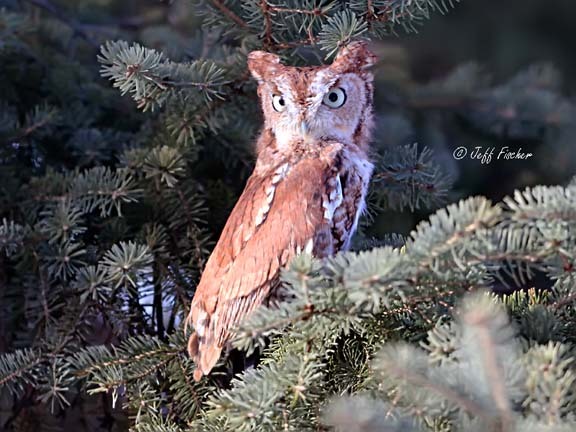 Eastern screech owls also can come in a red color. This is Mestaae, an education bird at The Raptor Center. In the eastern portion of their range only about 30% of the birds are this rusty color but in the western portion of their range, which includes Minnesota, only about 15% are red. We have had 3 eastern screech owl education birds since I have volunteered at The Raptor Center, only one was gray the other two, including Mestaae, where both red. 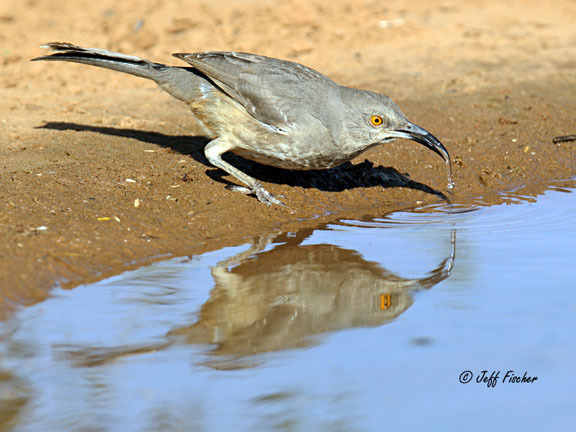 On our trip down to Texas last February we were fortunate to get some pictures of a curve-billed thrasher. We frequently see the long-billed thrasher when we are in Texas but the curved billed thrasher is usually more difficult to find.They live in scrub, mesquite and semi-desert in south Texas, New Mexico, Arizona, and Mexico. Since this bird was photographed in southeastern Texas it would be a member of the eastern population. 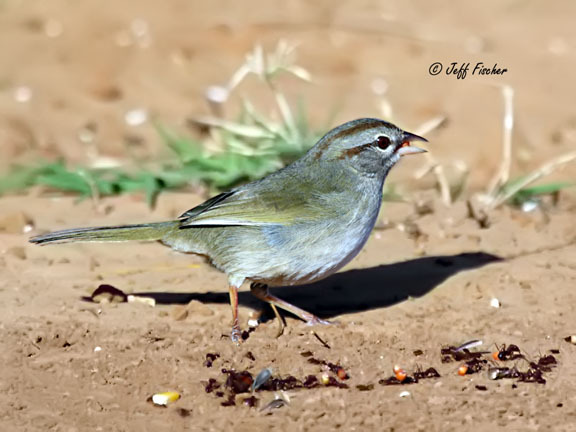 Birds found in the western portion of the range, like Arizona, would have a grayer breast, barely visible wingbars, and gray tis on the tail instead of white. When we are photographing in Texas we are always warned to make sure and drink plenty of water, it looks like this thrasher got the same message. Most people know how pelicans hunt. From an early age many of us have seen cartoons that feature pelicans whose bill can expand like a large pouch. This is fairly accurate at least when it comes to white pelicans. 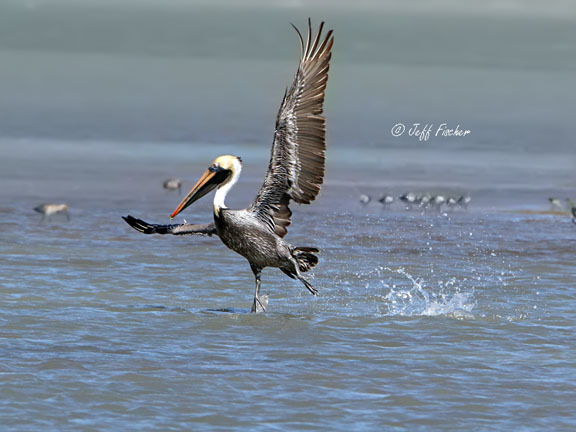 Brown pelicans however are a different matter. They usually fly low over the water scanning for fish and when they see one they dive head first into the water. Often there dive is so sudden that the rest of their body tumbles awkwardly into the water behind their diving head. Like many predators hunting for prey there are many more failures then successes. 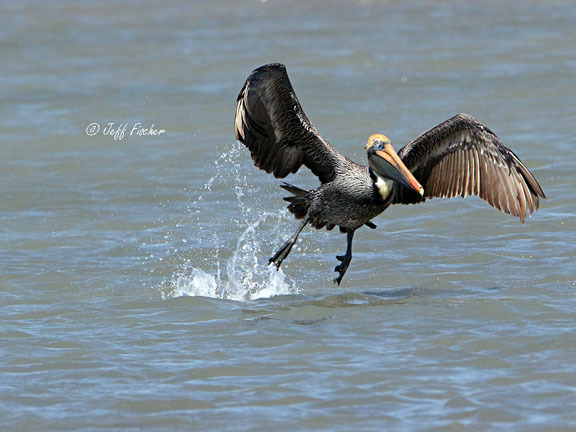 But when a brown pelican fails it gets back up into the air and gets ready for another dive. 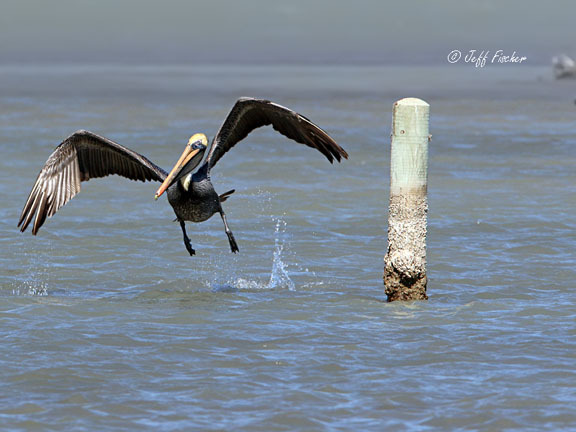 These pelicans were photographed in south Texas near Brownsville. 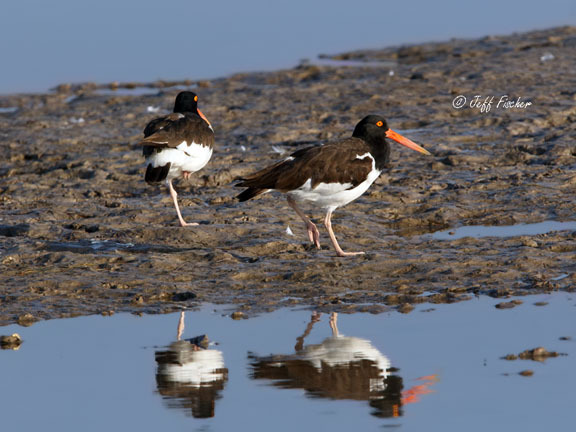 The American oystercatcher can be found around the coastal areas of North, South, and Central America as well as the Caribbean. They eat primarily shellfish, crustaceans, and other aquatic invertebrates. To catch their prey they typically stab their beak into a partially open shellfish before it can close its shell. 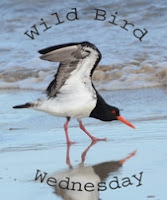 Since they rarely travel very far inland their nest consists of a scrape located at a higher spot on the beach. One nice thing about traveling to warm places during the winter is getting to see birds that you never get to see back home. In Minnesota the only egret that we usually see is the great egret.I still remember how excited that I got when I saw my first great egret as a kid. Down in Texas they have a few other species of egrets that are only rare visitors to Minnesota. 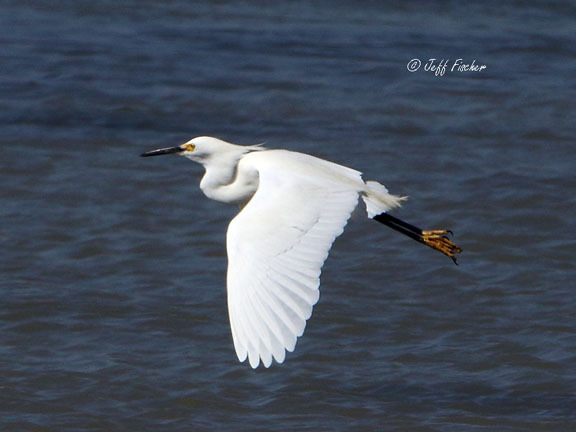 One example is the snowy egret. Snowy egrets look very similar to great egret except that they are smaller. Sometimes size is tough to gauge, especially from a distance, so there are other a couple other field markings that you can look for to help determine whether a bird is a snowy or great egret. First of all snowy egrets have bright yellow feet where great egrets have black feet. Unfortunately their feet are often not visible in the water. Snowy egrets also have lacy plumes on the back of their head and tail. Great egrets have no plumes on their head and long plumes on their tail. 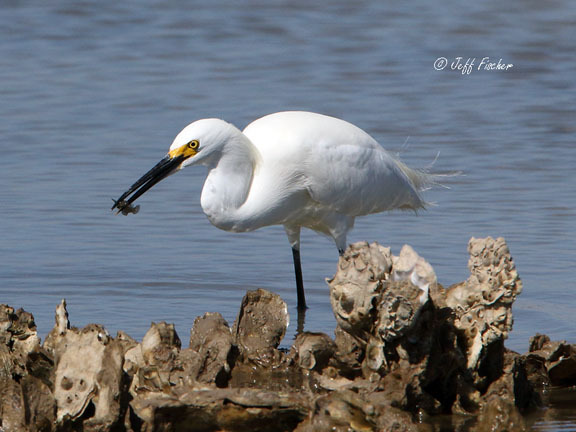 Finally snowy egrets have a black beak with yellow lores, the area around the beak and eyes. Great egrets have a yellow bill with yellow lores. Most species of egrets were hunted almost to extinction in the late 1800's and early 1900's. feathers were in fashion at the time and hunters killed millions of birds in order to adorn hats and other articles of clothing with lacy feathers. The Migratory Bird Treaty Act of 1918 put a stop to the legal feather trade by protecting feathers, body parts, nests, eggs and the birds themselves for all native species of birds other than game birds like ducks and such. The illegal feather trade continued but eventually feathers went out of fashion. Even though most of the hunted species made a comeback and are not endangered today they are still protected.